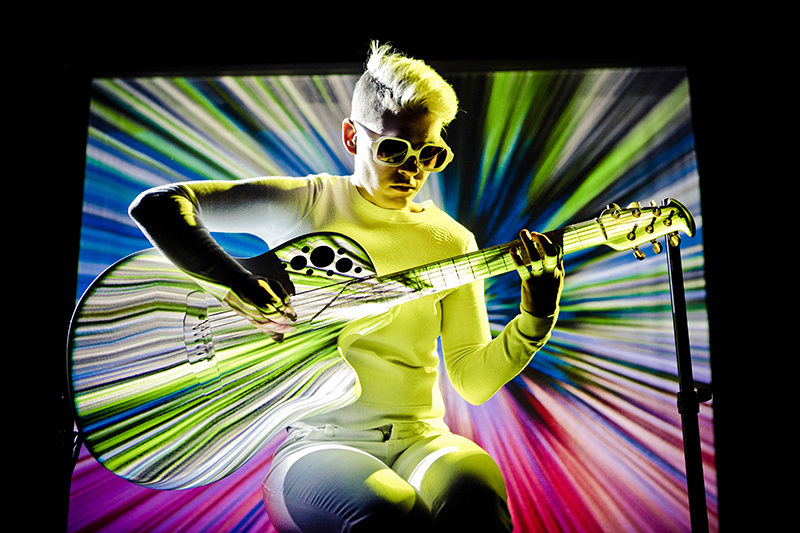 With her daring multi-media show, The Neck is a Bridge to the Body, solo acoustic guitarist Kaki King explores the joys of oobleck, MIDI software and anthropomorphic surrealism. You could be forgiven for believing that solo acoustic guitarist Kaki King’s multi-media show, The Neck is a Bridge to the Body, is the work of an artist with the neurological condition known as synesthesia. Psychology Today identified synesthesia as occurring “when stimulation of one sensory or cognitive pathway (e.g., hearing) leads to automatic, involuntary experiences in a second sensory or cognitive pathway (e.g., vision).” This crossing or blending of the senses arises in individuals who associate certain colors and tastes with numeric values, musical notes, and/or letters of the alphabet. Layered sensual stimulation is one way to describe how an audience experiences King’s psychedelic shows. Via the use of MIDI-based software, King’s musical technique is translated into a visual language. Nonstandard tuning, fingerpicking style and percussive tapping both invoke and evoke color, texture and cinematic narrative. It’s as if the musical and technological designs that create and operate the show have been fused, mimicking the complex cognitive processes known as synesthesia. Since the early 2000s, King has steadily built a loyal following, and her handiwork can be heard on various soundtracks, including flicks August Rush and Into the Wild, for which she earned a Golden Globe nod in the Best Original Score category. King’s latest record, Kaki King Live at Berklee, is her second major release in just over two years, and she’s scheduled to perform live dates through March 2018. In addition, The Neck is a Bridge to the Body, which premiered in March 2014 at BRIC House Ballroom in Brooklyn, New York, continues to generate a buzz. For all her individual accomplishments, King allows the technology that’s made her show a success to take center stage. Of even greater significance, King has receded into the very fabric of the production, becoming visually and virtually indistinguishable from its multi-media components. Let us explain. MIDI-based audiovisual software, which triggers specific video files. This imagery is then projected onto an upstage screen and the guitar, which has been custom-painted white, frets and all. Dressed in solid white, with matching sunglasses, shoes and a shock of bleached hair, King alternately absorbs and avoids the direct path of the projector’s beams via choreographed arm movements. Producing imagery for The Neck… was one thing. Controlling these images was another. King needed a reliable software configuration that could efficiently transform audio into video and bring order to the proceedings. Once the software situation was sussed, gigging with the equipment necessary to stage the show became another major issue. Although King herself says, “You’d be surprised at the dives in which I’ve staged this show,” travel costs are still a major concern. All guitar gear and hardware had to fit snugly inside backpacks, suitcases, and rolling bags. For one thing, since the Ovation remains stationary — it is a projection screen, after all — it requires a stabilizing guitar stand. required for The Neck… is fairly minimal. Short-throw projectors are utilized for both the rear screen and the blanched guitar, which is positioned three feet or so downstage of King. A web cam is placed right above the downstage projector’s lens. The Spacial Scanner utility app within MadMapper software receives information from the camera and measures the distance from the guitar to the projector so that a video mask can be designed. “In moments of improvisation, it becomes a challenge, but also a game between the two of us in which we are pushing and pulling and influencing one another,” adds Bernstein. This level of comfort is something that has been earned, not bestowed. King admits that the show has been tweaked and become stronger, smoother and more theatrical over the last couple of years. “It’s the tiny, small, subtle but fixable elements that get tightened up, show after show, that make a big difference from one year to another,” says King.